It’s been two bucket lists since 2015 and since I’m sharing them with you, I find myself making an effort to follow them. In March, my bucket list was quite short and easy to follow. I made a flour-less cake but it didn’t puff up ;), I planned my trip to Paris and made lists of new places to visit and things to do, I walked around Beirut quite a lot, and I cooked an Ethiopian ethnic meal (recipe here). This month, let’s hope I achieve more of my list. Lately, I’ve been hearing a lot of people talk about their Kindles, how simple it is and how much they love it. Lots of other people also talk about how when they need a specific recipe, all they have to do is google it. I might be a bit old-fashioned when it comes to books, but I can’t live without them yet. I still go for a read I can touch instead of yet another electronic object. In fact, we visit bookstores twice a month, in an endless pursuit of fine discoveries and inspiration, and that’s why, we’ll be selecting a great foodie book every month of 2015 to inspire you. What’s excellent about this recipe book is how it is divided into seasonal sections. Whether you’re looking for a fresh summery salad, a cozy cake or a warming soup, this is the book for you! It’s not new but it’s an absolute must-have for aspiring and amateur cooks. 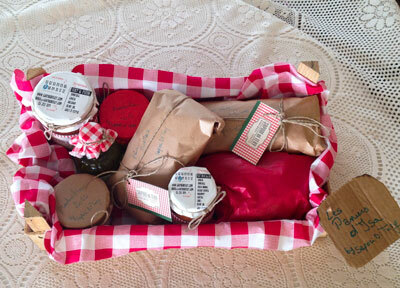 The recipes and ingredients used are simple and accessible, yet creative and innovative. 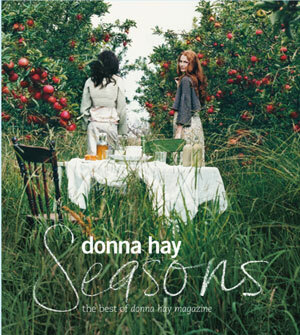 I’ve often mentioned Donna Hay and I have to say I’m getting addicted to her ideas. Already 3 recipes inspired from this book have been featured on Breadonbutter: These BBQ-ed Prawns, This Coffee Cake and This Pumpkin Soup. Check them out, they’re simple and delicious! I have often been told: Follow your dream. Whatever you decide to do, it has to be in pursuit of your dream. 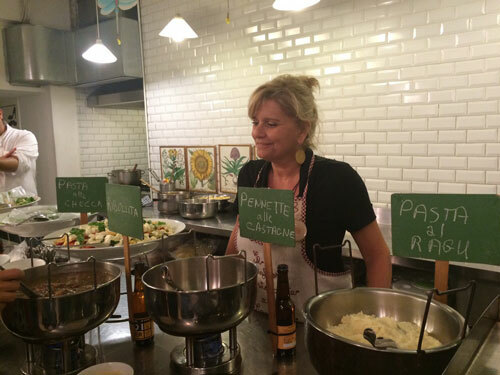 If you’re into the culinary world of Beirut, you’ve surely heard about Isabella Baffa. She’s the founder of Sapori di Tery (coming to it) and an amateur cook turned guest chef in all the popular, trendy and hip Beirut places-to-cook. 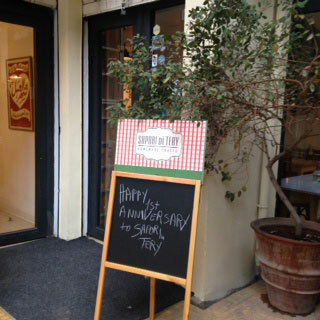 On the 9th of December, Isabella celebrated Sapori di Tery’s first anniversary at Tawlet. A year before that, she was at the same place serving food to the food-avid Beirutis. Today, I’m sharing her story. Isabella is Italian not only by name but also at heart. She worked for 17 years in the fields of PR, Marketing and Communication. But after realizing this wasn’t what was making her happy, and that what brought her the most joy was actually cooking, tasting and sharing food, she made a drastic change of career. 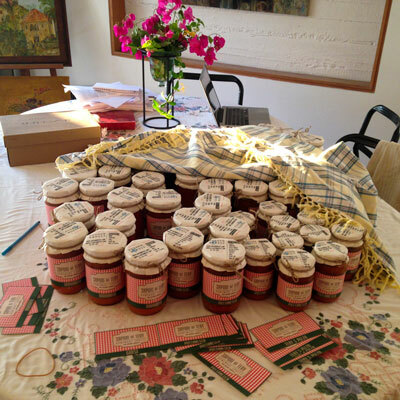 Inspired by her mother Tery’s cooking, together with her childhood days spent in the kitchen with “sauces simmering and cakes baking”, she created her own brand of sauces called Sapori di Tery (Italian for ‘Savors of Tery’). A year later, she’s still going strong. As well as preparing her sauces, Isabella gives cooking classes in all hip cooking places in Beirut (like Kitchen Lab and Tawlet). She also organizes dinners and lunches for private parties. For Sapori di Tery’s first year anniversary, Isabella cooked at Tawlet, the first place she was given the opportunity to present her skills to the world a year ago. Here I am a year later, right where I started my incredible journey and dream, in TAWLET. Words fail to describe how fulfilled I am. 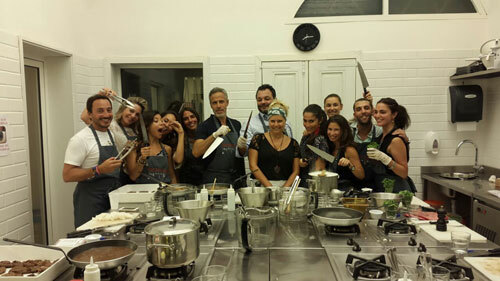 Experiences, hard work, happy moments, stressful moments, delight, feedback from each client coming back to buy Sapori Di Tery’s sauces, events making me discover a different world, cooking classes with all kinds of people, men women, children, cooking trainings in remote areas, sharing my passion with each and every person, …. Being Italian, Isabella considers sauces as the basis of any pasta dish (the fundamentally favored Italian dish). Isabella puts a lot of work into her sauces. Not only are they handmade, but their process took and still takes time, patience and heart. Isabella spent a year tasting and testing. She made them for friends who were kind enough to give true feedback, she traveled for inspiration, she peeled and still peels freshly-bought tomatoes. What makes Sapori di Tery is that it’s home crafted with a cook’s own hands, adding a delicate touch that is becoming very hard to find. The sauces are numerous and different, and their flavours are mostly inspired by Isabella’s travels and friends. She sometimes names the sauces after the person who gave her the recipe, like Giusi and Giulia. Sauces with an identity is what created Sapori di Tery and kept it growing. That’s Isabella’s story. I hope it will inspire all you cooks who enter the kitchen and see their problems swirling away with the smell of fresh ingredients and simmering delights. But before you wander off to your stoves, that’s not all! I’m so excited to announce a collaboration between Breadonbutter and Isabella in 2015. Stay tuned for it, I’m sure you kitchen lovers will just fall in love with it. P.S. You can find Sapori di Tery sauces at Farhoud, Rue du Liban Ashrafieh – The Food Dealer, Mar Mikhael Beirut – Maison Chal – Adma. You can also order them by calling directly on 03-201009 or by sending a message on Sapori di Tery’s facebook page (here).